Welcome to the mountain town of Winter Park, Colorado. Located in Grand County, Winter Park is situated in a high mountain park at an elevation of 9000 feet. The Town of Winter Park (pop. 720) is 7.5 square miles, including the base village of Winter Park Resort. The town and ski area have long been popular with Denver Metro residents, though the region is quickly becoming a four-season vacation destination. Fraser (pop. 732) is 6 square miles and is the more service-oriented of the two towns, with a grocery store, elementary school, library, town hall and drug store. Both towns are characteristic of season resort towns. The Fraser Valley is only 90 minutes northwest of Denver, 90 minutes from Summit County and two hours from the Vail Valley. During the winter you’ll never run out of terrain while skiing or boarding, whatever your level of expertise. 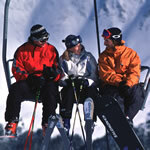 Chose from the resort’s five mountains, Winter Park, Mary Jane, Vasquez Ridge, Parsenn Bowl or Vasquez Cirque. That equates to over 2,800 skiable acreage and 134 designated trails. Winter Park Resort's Tour Center offers several activities for visitors who need a break from the slopes or want to sample some mountain recreation without skis or a snowboard. 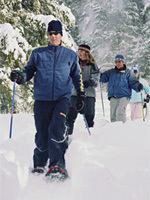 Redfeather Snowshoe Tours are a fun and educational introduction to this invigorating sport. The two-hour guided tours depart daily at 10:30 a.m. and 1:30 p.m. and cost $25 (snowshoe rental included). Participants need to wear sturdy waterproof footwear and layered clothing. The tour begins with a ride up the Gemini Express chairlift and continues with a gentle downhill trek through forested trails on Winter Park Mountain. Guides introduce the basics of snowshoeing and discuss the history, native plants and animals of Winter Park and the Fraser Valley. Reservations are requested and can be made by calling the Tour Center at (970) 726-1616. The Advanced Adventure Snowshoe Tour is a five-mile trek through Winter Park's backcountry and caters to those who want to head deeper into the woods and have a more vigorous workout. Reservations are required for the advanced tours, which depart at 11 a.m. on Saturdays and Sundays and cost $35 including snowshoe rental. Independent explorers can take advantage of the Tour Center's self-guided tours and can rent snowshoes for $15/day or $10/half-day (8 a.m. - 12 or 12 - 4 p.m.). Visitors can experience the mountain in the comfort of an enclosed and heated snowcat cabin on the Scenic Snowcat Tour. The specially designed snowcat, which seats 12, follows various ski trails to the top of Winter Park Mountain and provides riders with plenty of opportunities to stop for pictures of the breathtaking vistas along the way. The two-hour tours depart at 10 a.m., noon and 2 p.m. daily and cost $30/person. Reservations requested. The Snowcat Shuttle whisks passengers up the mountain to meet friends and family for a leisurely 1½-hour lunch at Snoasis or The Lodge at Sunspot. Shuttles depart the base at 10:30 a.m., 11:30 a.m. and 12:30 p.m. and the return trips leave Sunspot at 12:30 p.m., 1:30 p.m. and 3:30 p.m. Cost is $25/person. A senior discount is offered for ages 62 and older. Reservations requested. Enjoy a night out under the stars on a Twilight Snowmobile Dinner Tour. Riders can drive their own snowmobile or pair up with a friend for a two-hour excursion that includes a cozy dinner of stew in a bread bowl, salad, dessert and a drink. The tour takes riders to the summits of Winter Park and Mary Jane mountains and across Vasquez Ridge. Incredible views of the Continental Divide and the twinkling lights of the Fraser Valley are part of this unique experience. Tours depart nightly at 5 p.m. and cost $70/driver and $30/passenger. Drivers must be 18 or older and riders must be at least 6 years old. Reservations required. To escape the snow altogether, visitors can test their climbing abilities on the Base Camp 9000 Climbing Wall inside West Portal Station at the base of Winter Park. The 30-foot wall is open Friday and Saturday from 5-7 p.m. and offers multiple routes that can be changed to vary the degree of difficulty. Cost is $10 for three attempts to the summit and includes climbing equipment rental (helmets, climbing shoes and chalk bags). The name Winter Park has become a bit of a misnomer. 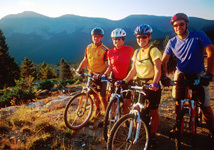 During the warm months, the resort offers a full range of activities as well. Choose from golf at one of the four area courses such as the Pole Creek Golf Club, the Grand Elk, or the Sol Vista Golf Ranch. Have a taste for adventure? Winter Park is Colorado’s Favorite Mountain Biking Resort with 50 miles of lift accessible single-track trails, a race series, a bike repair and rental shop, as well as a full staff of mountain bike instructors, patrollers and mountain hosts. While in Colorado, it will be hard to miss the allure of the Wild West. The Resort offers great packages to give you a chance to raft down the mighty Colorado River, explore the trails by horseback, and then attend the High Country Stampede Rodeo. Take in the scenery along one the many hikes. Hikes the St. Louis Lake Trial for expansive vistas and lush wildflowers, enjoy the spectacular scenery along the High Lonesome Trail, part of the 3,100 mile long Continental Divide Trail, or ride the Zephyr Express Chairlift to Sunspot and hike to the 12,060 feet summit of Parsenn bowl and take in the 360 degree view of the surrounding valley. For more information on Winter Park, click here. Skiing, snowboarding or playing in the snow are activities guaranteed to create a big appetite. To make sure that everyone can have a meal that satisfies, Winter Park Resort has 12 on-mountain eateries that range from casual cafeterias and food courts to full-service restaurants. Since breakfast is often cited as the most important meal of the day, skiers and snowboarders can start the morning off right with breakfast sandwiches, pastries and espresso at the new Boxcar Deli, open daily at 8 a.m. For a more complete breakfast, the food court at West Portal Station also opens at 8 a.m. with Einstein Bros Bagels, Seattle's Best Coffee, juice, fruit, cereal, baked goods and a full breakfast bar. When lunchtime rolls around, skiers and snowboarders can simply follow their noses as the smell of grilling, frying and cooking wafts through the air. Back at the base, the Boxcar Deli serves custom-built sandwiches, soup, snacks and frozen desserts. The food court at West Portal Station emphasizes variety: Mexican specialties, pasta, pizza, potato bar, hot soups, salad bar, deli sandwiches and the popular Good Times for burgers and fries. Food courts are also located at the Mary Jane Center and Snoasis with similar options for carnivores and vegetarians. For a quick slice of pizza and a cold one, the Derailer Bar in West Portal Station serves its signature pies from 11 a.m. to 3 p.m.
Pizza fiends who want to minimize their lunch break can phone in their order to Mama Mia's Pizzeria, located on the lower level of Snoasis, from the special kiosk on top of Winter Park Mountain. Sliders can dive into their pizza the moment they arrive at the restaurant. Sports lovers can catch the latest action and events on TV while munching on a slice of pizza at Pepperoni's at the Mary Jane base. Lunch Rock Café at the summit of Mary Jane is famous for its generous portions of hearty stew and chili served in bread bowls for under $7. For a leisurely lunch, the Club Car restaurant at Mary Jane is the insider's choice. Along with favorites such as homemade seafood chowder, the popular "Cup 'n a Half" (soup and a half sandwich), fresh salads and the notorious Mississippi Mud Pie for dessert, the Club Car is introducing new menu items this season. The award-winning Lodge at Sunspot offers the ultimate on-mountain dining experience. The spectacular log and stone structure is decorated in the style of old-time lodges and the enormous picture windows feature views of the Continental Divide and the Fraser Valley. The Dining Room's lunch menu offers a selection of homemade soups, hearty sandwiches, creative pasta dishes and daily chef specials. The Provisioner, adjacent to the Dining Room, is a food marketplace with grilled sandwiches, homemade soups, salads, baked potato bar, hot pasta and sauces and an assortment of freshly baked goodies. Winter Park's après ski options offer even more variety. For a sweet treat, children and adults can visit the Candy Cache in West Portal Station. Besides candy and snacks, the shop offers paperback books, newspapers, gifts and essentials. Adults seeking après ski fun, including live music and great food, can choose between the Derailer Bar and Club Car. For a memorable evening, guests can ride the Zephyr Express lift in gondola cabins to The Lodge at Sunspot. Before heading into The Dining Room, guests can relax with a cocktail from the full service bar in The Lounge at Sunspot. The Dining Room's gourmet five-course meal includes a selection of entrees such as elk au poivre, pistaschio encrusted sole or veal chop bordelaise. For reservations, call (970) 726-1446. "The days of burgers, fries, hot dogs and chili as ski resort cuisine are definitely a thing of the past," says Joe Cisneros, director of food & beverage for Winter Park Resort. "We have a lot of fun creating dining experiences and menus to please every appetite and mood." Get away from the ordinary aboard the Ski Train. Train buffs and outdoor enthusiasts can board the Ski Train at Union Station and take the sixty-mile ride to the base of Winter Park Mountain. The Ski Train is the largest passenger train in the U.S., carrying over 750 passengers and crew each trip from Denver to the base of Winter Park Resort, serving the Winter Park and Mary Jane ski areas. The train's 67-mile route takes you through some spectacular scenery that is in most cases inaccessible by auto, and seen only by train passengers and goat herders. The 20 car train takes you past the I-70 crawl and travels by historic mining country, through 29 tunnels including the 6.2 mile long Moffat tunnel (second longest in the U.S.), and ends right at the base of the Winter Park Resort, just a short walk from the lifts. For non-snow enthusiasts, free shuttle buses operate every 15 minutes to destinations throughout the Fraser Valley. For reservations, call 303.296.ISKI or check out their website at www.skitrain.com. If you are driving, to get to Winter Park Resort from all points around the Denver area, find your way to I-70 heading West out of Denver. Follow I-70 West approximately 40 miles to Exit 232 to Winter Park, Empire and Granby. Follow Exit 232 onto Hwy 40 which will take you over Berthoud Pass (great photo ops) and to Winter Park. Mileage from Exit 232 to Winter Park is approximately 24 miles. Total mileage from Denver is 67 miles. Winter Park Resort is located at 239 Winter Park Drive, Winter Park, Colorado 80482.